Lehengas are the thing of search when the weddings are approaching. Search for lehengas is never ending. To get good lehenga, you put all the efforts by going from markets to markets But online shopping makes this thing easier. You get a lot of options and choices in front of you to select from and that too when you have the option of brands to select. 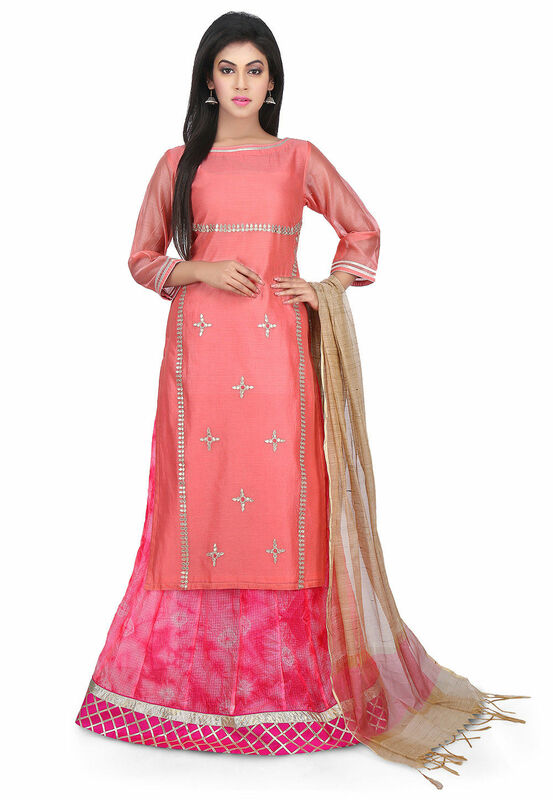 Utsav fashion is that one site which gives you a platform to select some amazing outfits. This is a Pure Kota Silk Circular Lehenga in Pink.This is readymade attire is designed with Batik Dye, Resham, Gota Lace and Patch Border Work.It is available with a Art Chanderi Silk Embroidered Kameez with Cotton Lining in Peach and an art chanderi silk dupatta in beige . Lehenga and kameez length are 42 and 45 inches respectively. No doubt, This kind of style has become very famous lately. A kurta with a lehenga skirt is something very much in the trend and since it is of silk, it has ability to be the centre of attraction. Also, the colour is very attractive. The details have been taken from the same site. For further details you could check the link below.